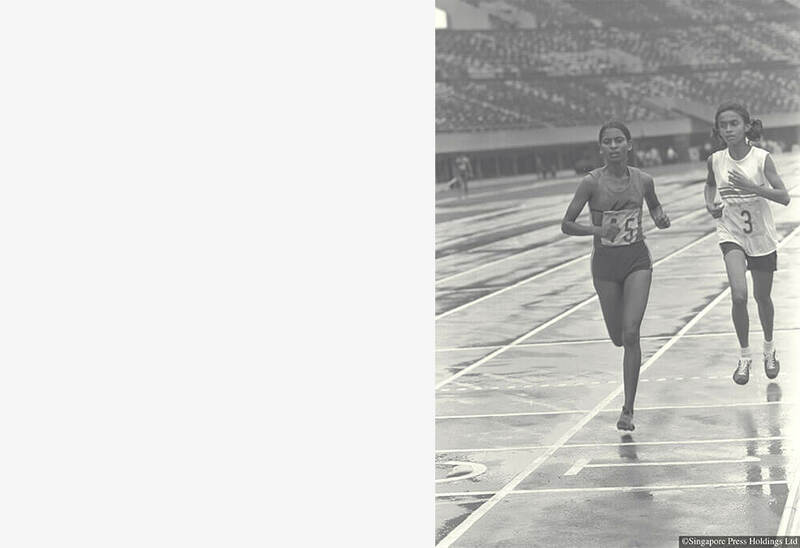 In September 1973, when the SEA Games were held in Singapore, 17-year-old Kandasamy Jayamani skipped school and went to the National Stadium to watch Glory Barnabas compete in the 200m final. It was a sensational race, with Glory winning the gold medal in a photo-finish. For Jayamani it was a defining moment – she set her heart on being like Glory and winning gold for Singapore. Ten years later, the SEA Games were again held in Singapore and Jayamani, by now well-established as a top-notch middle-distance runner, was the favourite to win the 1500m and 3000m races. But it was not to be – she only managed to win the bronze medal for the 3000m event. Jayamani was bitterly disappointed. But she had one more event, the inaugural SEA Games marathon. She had only done two trial runs of the marathon before the Games and would be competing with seasoned marathoners from Thailand and Burma. Winning a medal was a long shot but she was determined. “I told myself I just had to do it,” she later said. She described how, as the long race neared its end, she was in second position, trying to catch up with the leader, the Burmese Mar Mar Min. 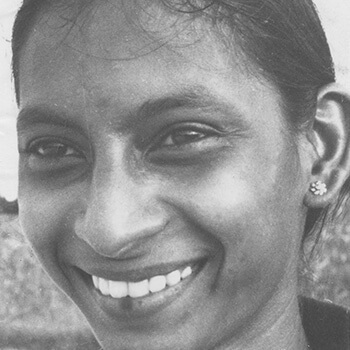 Jayamani won her gold, becoming Singapore’s only female marathon gold medallist – a title she still holds today. Growing up, Jayamani was influenced by her father and older sister who were keen on sports and who took part in many Big Walks. In school, Jayamani played badminton, basketball and volleyball and when she was 12, she began to compete as a race walker. But there were not many race-walking events, and she was advised by her coach Maurice Nicholas to switch to middle-distance races in order to be able to participate in more competitions. Soon she was winning medals at athletic events not just in Singapore but regionally and internationally. In 1982, while competing in Germany, she set national records for the 1500m (4:31.2) and 3000m (9:56.6) events — records which still stand. Taking part in these athletic meets was at times a real challenge for Jayamani. In 1976 she started work as a lift attendant at the Port of Singapore Authority and often she had to take no-pay leave in order to participate in competitions. After three years of trying to juggle her sports career with her work commitments, she left and found a job in administration at the Asian Athletics Association where there was greater support for her athletic activities. Jayamani dreamt of representing Singapore at the Olympics and was due to take part in the 1980 Moscow Games. But her dream was dashed when Singapore joined the United States-led boycott of the Olympics, a move to protest the Soviet invasion of Afghanistan. Losing the chance to represent Singapore on the biggest world sports stage was one of her biggest regrets. 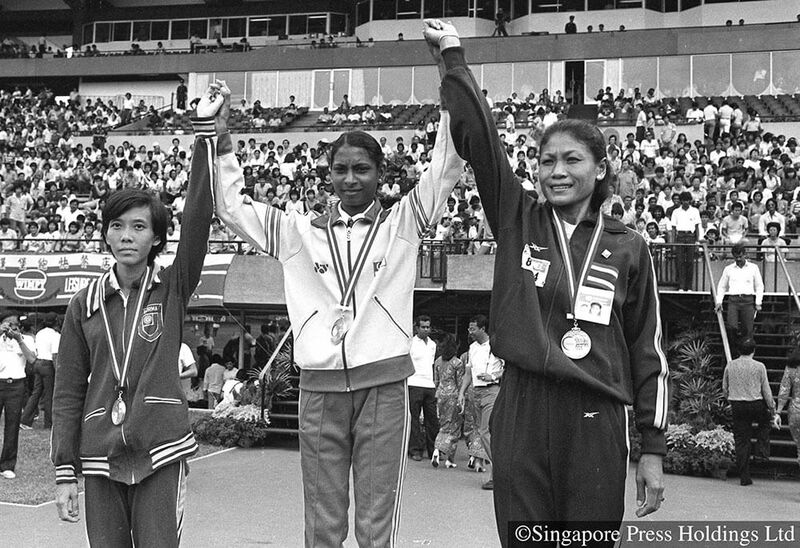 Jayamani was twice named Singapore’s Sportswoman of the Year, in 1977 and 1981.